making use of what we've got on hand or can get for a bargain makes decorating fun! then i picked up four new items, and spent about half an hour arranging them all. [and THAT is why it pays to hit the after-Christmas sales! the shelves hang over my desk, and are a great place to play with small seasonal changes. you don't always have to do big things to make a big impact! in a small room like my office, this is enough. it highlights the engraved print on the sweater-wrapped bar glass. i paid 45 cents for that glass at a Goodwill store over ten years ago! and use to create a fresh new grouping? clear crystal? white ironstone? or perhaps some vibrant colored glass? take a look in your cupboards and see what is waiting there! another thing i did with the 50 cent snowflake ornaments was add them to a wreath! 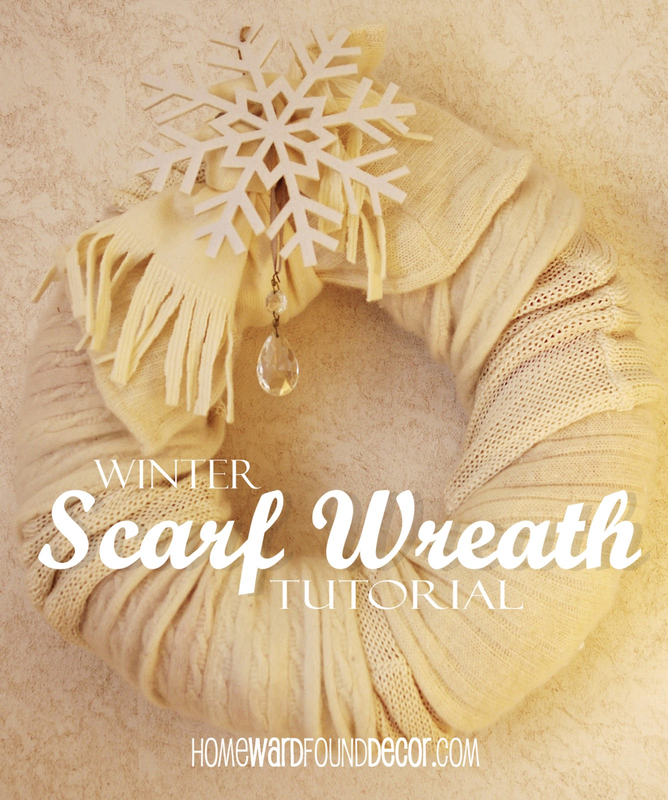 you can find the easy step-by-step instructions on my tutorial page. Your vignette looks beautiful! I LOVE whites!